Where in the World Is the Great Pyramid? 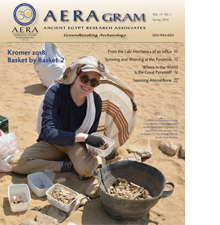 AERA members receive our AERAGRAM newsletter twice a year as well as the AERA Annual Report hot off the presses, months before we post these publications to our website. Donors also receive invitations to special events and regional lectures, as well as firsthand updates on research from the field. Please join or contribute online now. Your membership directly supports the main pillars of our mission: archaeological excavation, analysis, publication, and educational outreach. By contributing to AERA, you’ll receive the benefit of knowing that you’ve made a valuable investment in us all, helping to broaden our knowledge of the past, make an impact in the education of our students, and strengthen the future of our global community.